MABELLEarts is a community arts organization that brings together people of all ages, backgrounds and abilities to make art, tell stories and creatively transform public spaces. We are seeking two Community Arts Coordinators to join our team of artists, arts professionals, architects, community leaders, builders and gardeners for an exciting summer of art and neighbourhood transformation. We’re seeking two emerging leaders with a demonstrated interest in arts programming and youth engagement to lead two teams of youth in delivering arts-based programming in two Etobicoke parks. You are a highly-responsible self-starter with demonstrated experience working with youth from a range of cultural backgrounds. Your lived experience is a match with youth participants who are predominately low-income, racialized, newcomer youth and/or you bring demonstrated experience in working with these communities. Under the Direction of the artistic team and management of the Managing Director, the Community Arts Coordinators will each lead a team of youth employees and volunteers ages 15 to 21 to deliver arts-based programming and small-scale projects in two Etobicoke parks. The role will also include supporting a team of professional artists and hundreds of community members and guests from across Canada to realizing a large-scale community arts project through August. Community Programs (30%): implement programs for participants of all ages (some program design may be part of this role); manage workshop logistics, materials, supplies and snacks and support visiting artists. Assist with community outreach and social media. Youth Engagement (50%): provide supervision, management, and mentorship to youth employees and volunteers; provide support and deliver training to ensure success of youth employees and volunteers and the development of an equitable working environment; track youth hours and attendance; manage logistics related to transportation, schedules. Large-Scale Projects (20%): support as needed with large scale summer projects, including assisting with workshop facilitation and the creation of original artwork/performance elements and provide logistical and community engagement support. - Be 15 to 30 years of age at the time of employment. -Have been registered as full-time students in the previous academic year and intend to return to school on a full-time basis in the next academic year. -Be a Canadian citizen, permanent resident, or person to whom refugee protection has been conferred under the Immigration and Refugee Protection Act for the duration of the employment. -Have a valid Social Insurance Number at the start of employment and be legally entitled to work in Canada in accordance with relevant provincial or territorial legislation and regulations. Please include a cover letter with your resume. Applications without a cover letter will not be considered. 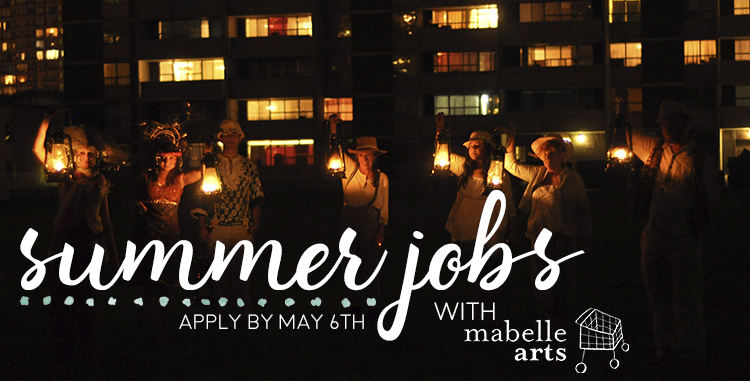 MABELLEarts encourages applications from all qualified candidates. We’re committed to developing an inclusive workplace with connections in the communities we serve. We encourage candidates from diverse backgrounds, including those who may need accommodation, to apply to join our team. Accommodations are available on request for candidates taking part in all aspects of the selection process. Our office is located in a Toronto Community Housing high-rise tower that has been equipped with automated entrances and exits, and our washroom is wheelchair accessible. Thank you for your interest in the position, however we will not be able to provide additional information by phone and will not accept calls related to the position. Only candidates selected for interview will be contacted.